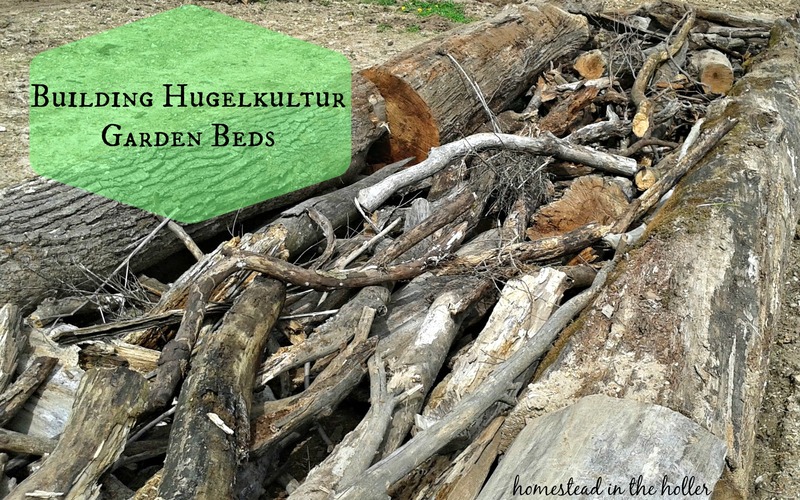 What is a hugelkultur bed? Hugelkultur is a German word meaning mound or hill culture. It’s a raised garden bed filled with rotting wood and topped with soil. The rotting wood on the bottom slowly breaks down, feeding the soil and retaining water. The older the bed, the better it works. It works well right away as a raised bed. It will just keep getting better as the wood breaks down and feeds your plants. Hugelkultur beds can be mounded or flat. Paul Wheaton has a lot of good information about hugelkultur beds here. We have a lot of trees growing on our property. There are also a lot of fallen trees, in varying stages of decay. 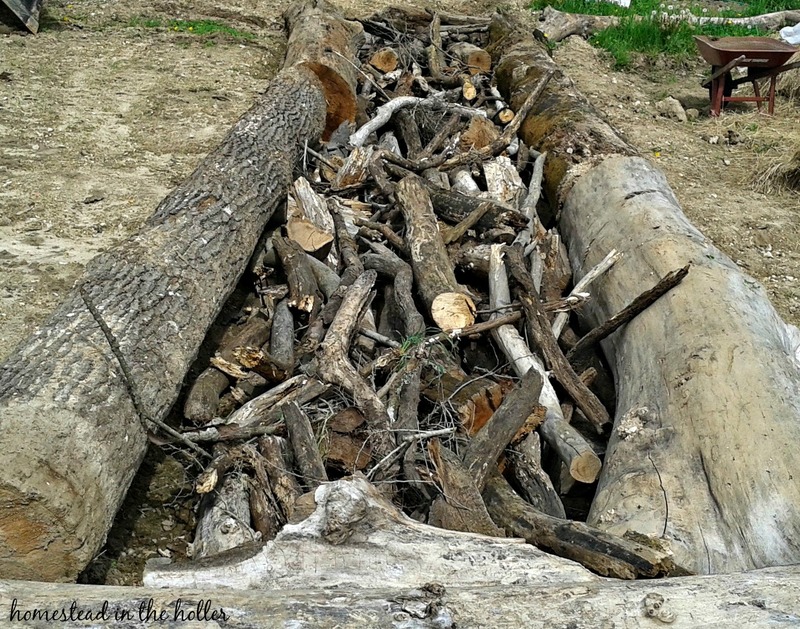 We decided to use what we had and made the sides of our hugelkultur beds out of tree trunks from dead standing or already fallen trees. I love it when we can source supplies from our own property! Most of the logs were quite large and required a tractor to get them into place. Locating rotten wood wasn’t a problem either. We found it everywhere! 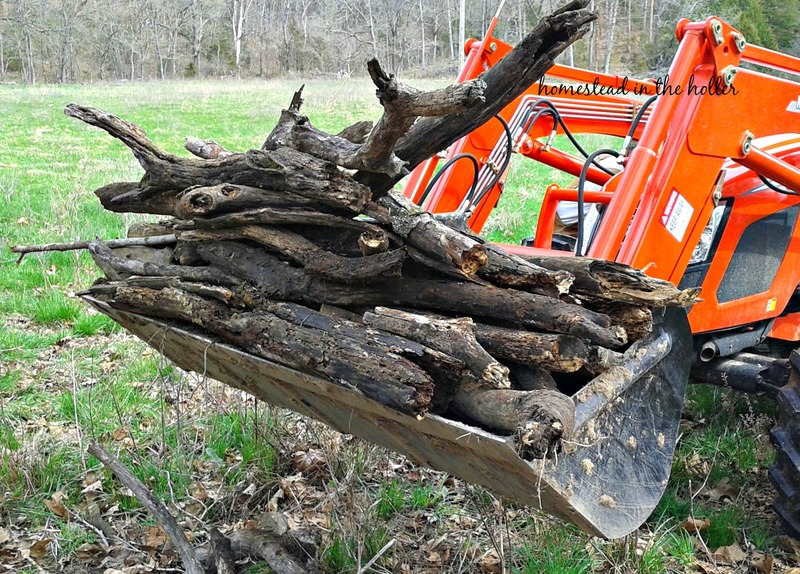 This was a great way to clean up an old homestead and put all that wood to good use! We scraped off the top soil to use for later and dug down a couple feet in the area that we placed the bed. The logs that were the edges of the bed were placed around the dug in area. That gave us a lot of space to pile up the rotting wood. The more wood you have in the bottom of the beds, the better! Next, we placed large pieces on the bottom and filled in the holes with smaller branches. Don’t worry about air pockets or branches that won’t lay flat or just so. The soil that you place on top will help push the branches down and the branches will settle over time. After putting the rotting wood into our new beds, we put some of the original soil back into the bed to cover the wood. After that, we experimented to see what would work the best. Some beds were covered in cardboard with a thick layer of topsoil and compost was placed on top of that. On others we mixed cow and chicken manure in with the clay soil, topping it with a thick layer of topsoil and compost. The rest was covered with just topsoil and compost mix. Most of our beds are flat hugelkultur beds, with the exception of one mounded bed. I prefer the flat beds, they seem easier to plant and settle less. But I am curious to see how a mounded bed will work in 2 or 3 years. So we decided to include one in the garden. I planted the garden as soon as the beds were done. It was a wet summer, and because of that, people had trouble with our clay soil retaining too much water and water logging their plants. Even though the hugelkultur beds were new and not to their full potential yet, I was very happy with how they worked. The plants didn’t become water logged in their beds. I rarely had to water, even in late summer when things dried up. There really wasn’t a difference in how the beds worked with the variations that we tried. They all worked equally as well whether we used cardboard, manure or just topsoil and compost. The flat beds did seem to work better than the mounded bed, that may change over time. In the spring it was noticeable that the beds had settled, as several beds had holes that went down to the branches. I filled those holes up with more topsoil/compost, smoothed the beds over and planted again. The hugelkultur beds work much the same as the first year. My garden did very well and I watered the garden beds only occasionally. The mounded bed has settled significantly, which was expected, but it is still a mound shape. I continue to prefer the flat hugelkultur beds over the mounded bed, but it will be interesting to see if my opinion changes over the next couple growing seasons. Hugelkultur beds only improve with age! This spring as I have been preparing the garden for cold weather crops, I have noticed that some of the branches that were close to the surface on the flat beds are starting to soften and break down. I haven’t found any holes to fill, the wood underneath has settled. I did find oodles of earthworms. This should be the year the hugelkultur beds start to really shine. The beds continue to work excellently. As the wood breaks down, the soil sinks down, so I can see that I will be adding soil and compost to the beds every year. Which is ok, because I like to amend the soil yearly anyway. I am most impressed with the rich dirt that can be found in the beds. Looking for other ways people have used hugelkultur? Chris from Joybilee Farm made these awesome beds for older homesteaders. 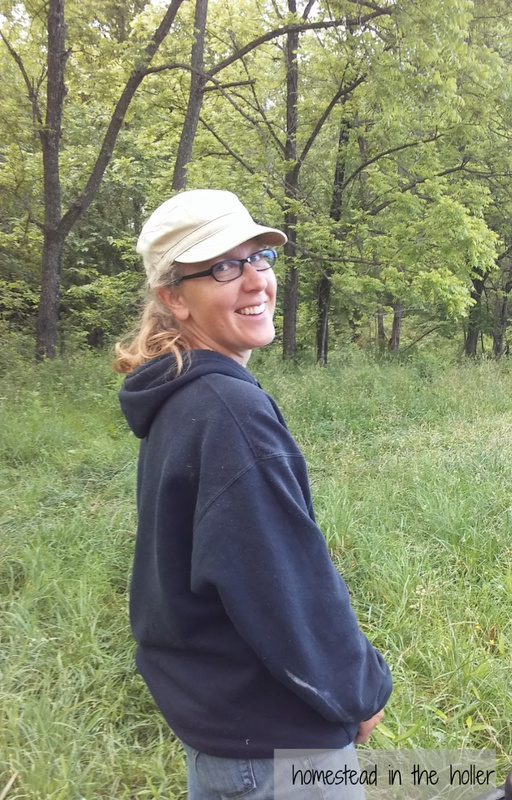 Liz from Eight Acres uses hugelkultur to rehabilitate an area on her property that was eroding. This entry was posted in Garden, Permaculture and tagged building hugelkultur beds, how to make a hugelkultur bed, hugel, hugelkultur, hugelkultur raised beds, raised beds. Bookmark the permalink. I have never heard of such a thing. We have about 2.5 acres and we do have trees that are past their prime. We do have areas of bush that we are cleaning up as well. It is something that I will discuss with the family. We have an area that this just might be the right thing to do. I am impressed that you did not have to water daily. Thank you for this one. I so appreciate the information. You are welcome! The first year the hugelkultur beds will act like any other raised bed, but they will only get better! Sounds like you have all the supplies that you need to try it out. I hope it works great for you! Was googling ” Breaking branches with your bare hands to make mulch ” which is what I have been doing for years …haven’t thrown out but a few trash cans of weeds in the 8 yrs we have lived on our half acre . Literally everything else…. tree branch / weeds taken away from trimming trees and cleaning up the yard has been made into soil . This is a great idea . This year I should have enough of all these ingredients in the photos above to create this kind of compost pile . My compost pile sits right above a river bed on a hillside . Once breaking down the raw material has been completed . This is what my compost pile will look like . Always looking for new ideas . Wow I am doing this for sure. We live in a zone 3 – 4 ( more 3 ) We just moved on to 7 acres that are pretty much rock out cropping, pine trees, hilly, Rocky soil with lots of slate rock. We want to get our perennials planted this year , like asparagus, blueberries, rhubarb etc. Do you think this maybe good to make and plant this year? Absolutely! I planted asparagus and rhubarb in hugelkultur beds after we built them last spring and they are doing great! I haven’t planted blueberries in a hugelkultur beds yet, but I plan to. I have had great luck with strawberries and raspberries. 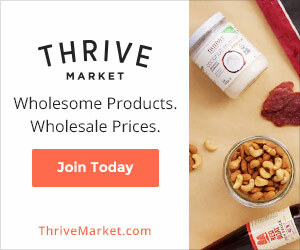 Let me know how it works for you! This is terrific. I previously had a rural property in western Oregon, and I used this technique for starting blueberry/strawberry beds. I created several long beds using old strawbales that a local farmer was only too glad to have me haul away. I filled the bottom area with charred and rotting wood from the property, then topped with compost and soil. The berries loved it. The beds were tidy, and I got to clean up a lot of wood that was lying around on the property. What a great find. There’s always tree trimmings that are to big to cut up but not big enough to burn in the stove. I will try this on a new bed. Thanks for sharing. I’m from Philippines.We planted ginger few years back on a clay soil but it’s sad to say that we haven’t harvested any.. The ginger were rotten. Timely this time we are on our plan to plant ginger again. Our seedlings were ready. When We read this article it gives us bright idea. We will be using hugelkultur this time.Thank you for sharing. We are using back to eden gardening with hugelkultur garden beds, they seem to complement each other. I live in Southern California and my yard is a steeply declining south facing slope. When my 100 ft tall three trunk pine fell down three years ago, my friend Fred advised me to build hulgerkultur terraces. Because we are in a drought, I haven’t really planted anything yet. But I look forward to moving forward with planting on my terraces and know my soil will be better than anyone else’s! Oh, that sounds interesting! I had great luck with hugelkultur beds in dry Colorado, I would think that they would work great in California as well. Let me know how it works once you try it out! I read about this last year. I find it fascinating. It makes sense, but I’ve never tried it. Like you said, a great way to deal with debris if you’re not going to use it for fuel. Thanks for sharing on the Homestead Blog Hop. I hope we see you again today. Has someone used this method to create property boundaries? I have some mostly dead trees on my 1/4 acre and some ugly and tall chainlink fence across the street side. Just wondering if someone has done this and how it worked for them. Thanks! I haven’t seen this used to create property boundaries, however I would think it would work great! Sepp Holzer builds mounded hugelkulturs and then plants trees and shrubs in them on the top and sides of the hugelkultur beds. That would work very well as a property boundary! As the trees grow, it would completely block the unwanted view. I saw this in Austin and thought this was so interesting. Do you have to climb up on them to harvest raspberries? If you made a very high mounded bed, then yes you would have to climb up on them, but you don’t need to mound the dirt that high. I planted my raspberries in flat hugelkultur beds, so by appearance, it was just like any other raised bed. It worked great, the raspberries really did well in that system.